Ambleside set in the centre of the Lake District at the head of Lake Windermere is a busy little market town surrounded by beautiful scenery and rich with history and heritage. The 17th century Bridge House, one of the smallest houses in Britain, built over Stock Ghyll was purchased by local people in 1926 and given to the National Trust. It is a Listed Grade 1 building and is used as an information centre for the National Trust and is part of the Trust’s Windermere and Troutbeck property. Ambleside Museum is home to many Beatrix Potter artefacts and offers an interesting insight into local life. The remains of a Roman fort, Fort Galava dating from AD 79, can be seen in Borran’s field at Waterhead. Nearby is Stock Ghyll Force which provides a stunning natural attraction. Ambleside is also home to the University of Cumbria and The Langdale & Ambleside MRT which is one of the busiest volunteer mountain rescue teams in Great Britain. Ambleside being one of the jewels of the Lakes is an ideal place for a walking holiday with easy access to the surrounding fells and for the less energetic there are strolls along the shore of nearby Windermere Lake. There are also boats trips on Windermere Lake, places to visit and a wide variety of shops both in Ambleside and Windermere town. Stock Ghyll Force is a spectacular 70 foot waterfall, in the spring the area under the trees is a carpet of daffodils. Stock Ghyll, a tributary of the River Rothay, tumbles down through a series of waterfalls to the centre of Ambleside passing under the famous Bridge House which is probably the most photographed building in the Lake District. The tiny building, originally an apple store for nearby Ambleside Hall, was built over the beck to escape land tax. It is said that at some time a family with six children lived here in the two rooms. Stock Ghyll and other local becks once powered twelve watermills producing bobbins, processed fabrics, paper and ground corn. Most of the mills have now been demolished or converted but the view from opposite the Bridge House offers an impression of those industrial times. The nearest mill is the Old Corn Mill on a site occupied by a mill since 1335. This was the old manorial mill, rebuilt in 1680 by the Braithwaite family of Ambleside Hall. The building was restored in the 1970’s for the use of shops. Wansfell lies 1.5 miles east of Ambleside and is part of the long southern ridge of Caudale Moor that divides Ambleside from the Troutbeck valley. It has an extensive summit ridge with two summits named Baystones a grassy hummock marked by a few stones at 488metres (1,601) and Wansfell Pike an attractive rocky top at 482 metres (1,581 feet). The summits are linked by a dry stone wall and even though Wansfell Pike is the lower top it is regarded as the true summit because of its superb views especially of Windermere Lake. The fell is mostly ascended from Ambleside on the western side of the fell using the road from the town centre which passes Stock Ghyll Force. 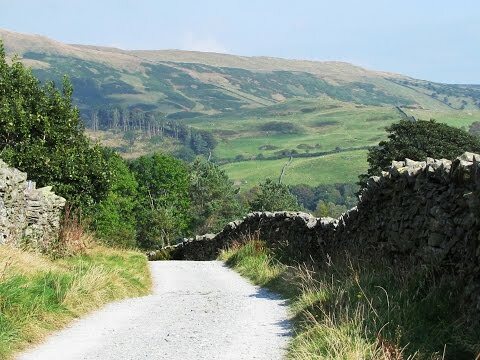 A slightly easier route of ascent is from Troutbeck on its eastern side following a farm track called Nanny Lane. The Windermere Way, a long distance footpath that circles around Windermere, passes over Wansfell. The 2.5 mile popular fell race takes place annually between Christmas and the New Year, the faster runners completing it in about 20 minutes. Troutbeck, a small tranquil village situated 3 miles north of Windermere town, is a conservation area and home to the National Trust property of Townend. Townend is an atmospheric farmhouse full of quirky objects and fascinating stories. The farmhouse was the home of the Brownes an ordinary farming family but today their home and belongings bring to life more than 400 years of extraordinary stories. The village also houses a combined Post Office, general store and tea shop and a pub The Mortal Man which displays a verse with reference to Sally Birkett’s Ale. We cross over the little footbridge at the end of the car park and turn right following the main road heading through the town. At the bend in the road we head forwards on the little tarmac road between Barclays Bank and the Market Hall. The road after a short way bears round to the left and we follow the sign for the Waterfalls. We keep following the road and turn left at the sign “This way to the Waterfalls”. After viewing the Stock Ghyll Force we head forwards to the track and turn right towards the exit. We go through the gate to the road and turn left. We follow the road and take the path on the right up some steps sign posted “Footpath to Troutbeck via Wansfell”. We now keep following the path, some of which is stepped, steeply uphill to the summit of Wansfell Pike. From the summit we head forwards through the gate in the fence and follow the path downhill until we come to a gate. We go through the gate and head forwards following the path downhill to the next gate. We go through the gate and turn right onto a track. We now follow the track called Nanny Lane to a gate. We go through the gate and turn right along the road through Troutbeck. At the combined post office, general store and tea shop we turn right and head uphill along the tarmac track called Robin Lane passing some houses on the right. The track becomes stony and we keep heading along the track uphill until it splits. We turn left through the gate and follow the path going slightly downhill. We cross over a footbridge and follow the track towards the farm, High Skelghyll. We pass through the farm and follow the track going through a gate into the wood. We keep following the track ignoring any paths off to the left. We cross over a little bridge and walk downhill with the stream on our left. The path bears right again and after a short way we follow the wall on our right. The track becomes a tarmac one and as we head downhill we pass some houses. We then come to a little back lane we turn right and follow it back into Ambleside. This is a moderate to hard walk on easy to follow paths and tracks. The inclines and declines are moderate except the incline up to Wansfell Pike is very steep, including some steps. Approx 6.5 miles allow 3 to 4 hours using OS Explorer Map OL7, The English Lakes, South-eastern area and OL5, The English Lakes, North-eastern area. Start point: Ambleside’s main car park on Rydal Road. Pay and Display £7 for all day. Ambleside situated at the head of Lake Windermere in the Lake District, Cumbria. From the A66 take the A591 to Keswick. At the t-junction turn left staying on the A591 past the lakes of Thirlmere, Grasmere and Rydal to arrive at Ambleside. Car park is on the right before entering the town. Parking: There are five Pay and Display car parks in Ambleside. In Ambleside there are four public toilets, Cheapside behind Barclay’s Bank, Low Fold car park on Lake Road, entrance to Rothay Park on Vicarage Road and Rydal Road car park. For refreshments there is a good variety of shops, cafes, pubs and restaurants to choose from. For refreshments at Troutbeck there is the Mortal Man Inn and a combined Post Office, General Store and Tea Shop.